2010 Suzuki Burgman Fuel Cell. Picture credits - Suzuki. Submit more pictures. 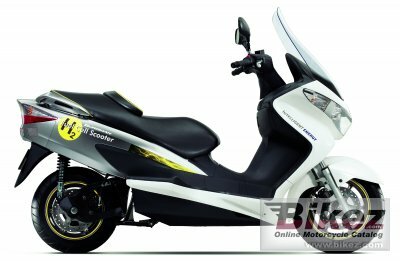 Suzuki developed the Burgman Fuel-Cell Scooter using technologies from the Crosscage concept motorcycle that it displayed at the 2007 Tokyo Motor Show, thereby realizing a more practical and accessible fuel-cell bike. Comments: Polymer-electrolyte type fuel cell made by Intelligent Energy. Fuel storage system: High-pressure hydrogen tank (70MPa). Secondary battery: Lithium-ion. Range 350km. Ask questions Join the 10 Suzuki Burgman Fuel Cell discussion group or the general Suzuki discussion group. Bikez has discussion forums for every moped. View comments, questions and answers at the 2010 Suzuki Burgman Fuel Cell discussion group. You can sign up for e-mail notifications when other riders answer you. If you have extensive experience with the MC, please send us a review. If you consider buying this bike, you should view the list of related motorbikes Look at photos. Compare technical specs. And check out the rating of the moped's engine performance, reliability, repair costs, etc. You can compare the rating with other bikes.